I am an EFL teacher from Brazil, living and working in Europe now. I love teaching, studying and my students. Although sometimes it is pretty hard to make ends meet, I am sure I made the right choice about my career! I enjoy this opportunity to share material and experience with teachers from all parts of the world! br "Tell me and I forget, teach me and I remember, involve me and I learn." 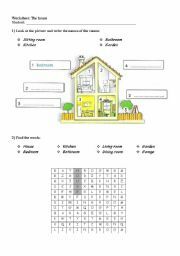 Students practice the vocabulary related to "house" in a funny way. They colour, find words in a wordsearch, label pictures...also nice to practice a little bit of colours. Hope you´ll like it! 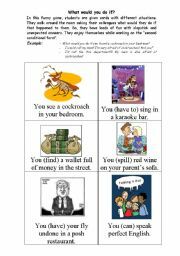 Students read about the main rules to report statements and questions, then, they practice it through different exercises. 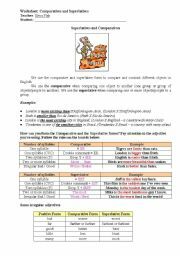 Activity developed to give the students the opportunity to practice "giving suggestions structures". Students can interact with each other practicing their speaking skills and enrich their vocabulary with different ways of giving suggestions. It includes cards and teachers notes. This is a funny activity based on the film: Finding Nemo. 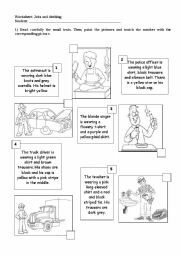 Kids love the characters, and the worksheet includes an easy reading comprehension, some writing activities and an activity in which pupils will put the story in order (pictures are provided). I hope you´ll enjoy it! 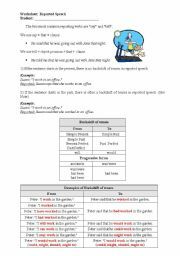 Worksheet to practice the Simple Present Tense. 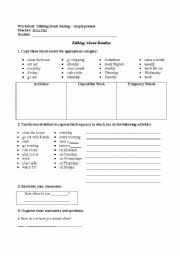 Frequency adverbs and routine vocabulary are included. About 5 pages of exercises. Students read small texts describing what each person is wearing. They colour the picture accordingly and match the number of the text with the corresponding picture. After that, students describe the tasks each worker has to perform (ex: a teacher teaches nice things to the students). I hope it´s useful! Students read a text about teenagers´ style. They answer the questions. Then, they´ll label pictures (ways of describing the "dressing style", such as casual, trendy, sloppy). They also have a match activity with special clothes (boots, platform sandals, tight clothes, etc). Finally they´ll describe two teenagers. 3 pages of activities. This is a brief presentation to review tenses (past, present and future) with students. 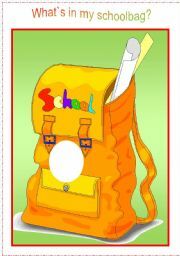 It´s based on the pre-intermediate book "New English File - lesson 3D".